These sections from an article in the Taranaki Herald of 7 November 1900 refer to 'anarchist' immigrants on the ship Tokomaru. Among the passengers the Tokomaru was carrying from Britain to New Zealand were a group of 'Clarion' settlers or Clarionettes. These immigrants had been inspired by the writings of William Ranstead in the English socialist newspaper, the Clarion. Ranstead had been so impressed during a visit to New Zealand that he wanted to set up a utopian socialist settlement in the colony. It was reported that tensions arose on the Tokomaru when one of the Clarion settlers called for 'three cheers for the revolution', in response to a group of passengers singing 'God save the queen'. Several Clarionettes openly declared 'anarchist and revolutionist sentiments.' 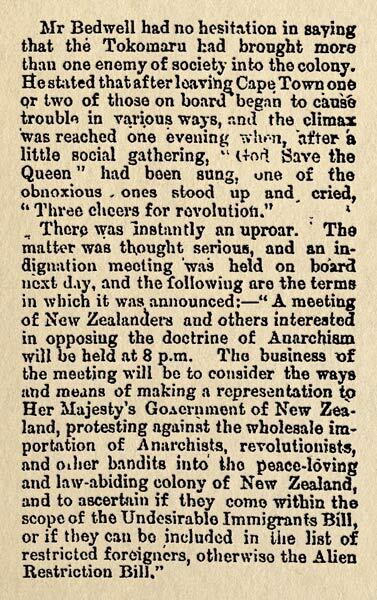 The 'loyal' passengers then held two 'indignation meetings' to protest against 'the wholesale import of Anarchists, revolutionists and other bandits' into New Zealand. They planned to bring the matter before the government on the ship's arrival in New Zealand. Captain Maxwell of the Tokomaru later claimed to know nothing about any trouble on board. It is noteworthy that following the assassination of US President William McKinley in September 1901, the New Zealand newspapers warned of the danger of 'foreign' anarchists coming to New Zealand, but appear to have seen no threat from the English Clarion settlers.